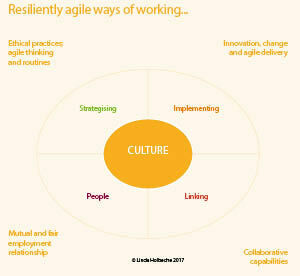 Ahead of the Relocate Festival of Global Mobility Thinking on 11 May, Dr Linda Holbeche, author of The Agile Organisation reveals how HR and mobility can support agile organisations. An Economist Intelligence Unit report in 2009 found that 88 per cent of executives cite agility as key to global success, yet many companies still admit to not being flexible enough. Why?At a CIPD National Conference in Manchester last year, an illuminating talk by Dr Linda Holbeche extolled the benefits of designing more agile organisations to a room of seasoned practitioners and strategists who wanted to take their organisation to the next level.With HR directors tackling new data regulations, never-ending compliance issues and trying to make sense of Brexit implications across their organisation, Ms Holbeche helped shed some light on how mobility teams could work more fruitfully. Having attended global conferences throughout the year where organisations are striving to take on more and more, as well as respond to changes in their particular industry sectors and continue to grow in new overseas markets, the importance of agility made much sense.The ability to understand what makes an agile organisation will be a natural stepping stone for many HR and in-house global mobility specialists. I will enable them to chart the course for their organisation’s mobility agenda, their assignees and business travellers, as well as the myriad of service providers and specialists they are responsible for in the complex area of managing international assignments, mobility and talent. So, what is agility and how does it work? In her presentation, Ms Holbeche went on to describe HR’s critical role in enabling more agile routines in the workplace. These included continuous learning, rapid decision making, creating adaptable structures and attracting and retaining multi-skilled and flexible people.She didn’t disappoint as she led her audience through some deep thinking backed up by extensive research and powerful case studies. Don’t miss Linda Holbeche’s unique insights on how HR and global mobility teams can become more dynamic and innovative by designing more agile structures. See her expand on this highly effective business strategy in person during an exclusive keynote at the Festival of Global Mobility Thinking on 11 May 2018. There was much that was optimistic at the CIPD conference and CIPD chief executive, Peter Cheese, reaffirmed his belief in the opportunities ahead for HR. He said that shaping the workforce of the future; being the beacon for trust, ethics and values and stepping up to the business and strategic partner roles that will come to shape companies in fast-changing times were all opportunities for HR.Ms Holbeche urged HR teams to build a culture of disciplined innovation. This can be done by acting as an “innovation hub” – collaborating with other disciplines to share knowledge, work on change programmes, design spaces and facilitate connections.In addition to this, she noted the importance of developing reward and recognition schemes that actively encourage innovation, teamwork and knowledge sharing.As overseas markets develop and international experience becomes critical for many organisations at a time when skills shortages are increasing, global mobility specialists have a crucial role to play in supporting and driving the agility and innovation agenda. International experience for women and younger generations are two areas where a substantial difference could be made. In The Agile Organisation: How to build an innovative, sustainable and resilient business, Ms Holbeche explores valuable insights for companies to work more creatively and profitably. Her new 2nd edition will be out in Summer 2018. For related news and features, visit our Human Resources section.Relocate’s new Global Mobility Toolkit provides free information, practical advice and support for HR, global mobility managers and global teams operating overseas. Access hundreds of global services and suppliers in our Online Directory ©2018. This article first appeared in the Spring 2018 edition of Relocate magazine, published by Profile Locations, Spray Hill, Hastings Road, Lamberhurst, Kent TN3 8JB. All rights reserved. This publication (or any part thereof) may not be reproduced in any form without the prior written permission of Profile Locations. Profile Locations accepts no liability for the accuracy of the contents or any opinions expressed herein.